Background: Many schizophrenic patients with a long-term administration of antipsychotic drugs do not regularly adhere to the prescribed pharmacotherapy. Antipsychotic drugs constitute a palliative, but not a curative treatment, and the long-term effect of these drugs is not secure. Patients tend to consume nicotine and alcohol, as well as some patients consume drugs such as cannabis and amphetamines. Objective: The objective of this mini-review is to examine the reasons for the high tendency of schizophrenic patients to consume alcohol, nicotine and drugs and in addition to suggest measures to reduce the abuse of substances and drugs. The effects of substances such as alcohol and nicotine and drugs such as cannabis and amphetamines on the disease outcome will be mentioned. Method: Previous reviews on the psychotic disorders and the pharmacological treatment were used to examine the effects of substances and drugs on schizophrenic symptoms and to investigate appropriate measures to improve medication adherence and the renouncement of consuming substances and drugs. Results: A possible coherence between the function of single susceptibility genes and the alteration of neurotransmitters is mentioned. The mechanism of action of the most important secondgeneration antipsychotic drugs and their indications are described. The tendency of schizophrenic patients to consume alcohol and nicotine and in addition the effect of both substances to possibly worsen psychotic symptoms are pointed out. The effect of nicotinergic agonists to support smoking cessation is described. The different compounds of cannabis, tetrahydrocannabidiol (a psychotomimetic) and cannabidiol (exerts antipsychotic actions), are mentioned. Because a reduced adherence to the pharmacotherapy is frequently combined with the abuse of substances, additional drugs, psychoeducation and the administration of long-acting injectable antipsychotic drugs could reduce the abuse of substances and drugs; these strategies could help to maintain the antipsychotic administration. Conclusion: The abuse of drugs and substances might be combined with a reduced adherence to the antipsychotic pharmacotherapy. Drugs and substances might in some cases worsen the psychotic symptoms. Appropriate measures to reduce substance and drug abuse as well as to improve the adherence to the antipsychotic pharmacotherapy are cognitive behavioral therapy, psychoeducation and the administration of long-acting injectable antipsychotic drugs. Some new drugs, for example the cannabis compound cannabidiol that shows antipsychotic properties and ß-varenicline, a nicotinergic cholinergic agonist, might be administered when substance abuse (cannabis, nicotine) occurs. 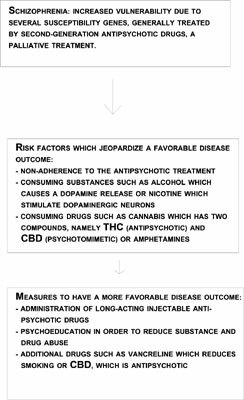 Alcohol abuse, cannabis, clozapine, long-acting injectable antipsychotic drugs, nicotine, psychoeducation, secondgeneration antipsychotic drugs, substance abuse.